This is one of those books that reads like fiction. I can compare it to "American Lightning" which I reviewed earlier this year in both its' scope and flow. It reads like good fiction ought to. George Leslie, the main focus of the book, is a ne'er do well son of an aristocratic family from Ohio. His father buys George out of military service in the Civil War. This makes him an undesireable person in the years following the war. By this time he has become an architect of some renown. But upon the death of his parents in the late 1860's he turns to New York City where he hopes to re-invent himself. Upon his arrival in New York in 1869 he begins to do just that. He starts with dinner at the old Delmonico's, then the most extravagant dining establishment in the world. Here he meets Jim Fisk who introduces Mr. Leslie to the likes of Jay Gould, William "Boss" Tweed, and most fascinating of all, Marm Mandelbaum. Ms. Mandelbaum's claim to fame is that she was the biggest "fence" in New York for the last half of the 19th Century. She held sway over all of the 5 Points Gangs that picked pockets, stole from stores, robbed homes and killed people. She paid 10 cents on the dollar for anything of value. She ran a school for young pickpockets that served as a model for Charles Dickens character Fagin in "Oliver Twist". Dickens had visited New York in the 1850's and met her. The following day Leslies' pocket is picked. The money and papers that go missing are trivial compared with what he has hidden in that wallet. Mr. Leslie had been at work on an invention that would soon revoltionize bank robberies. No more explosives, drilling or safecracking. George Leslies' "Little Joker" was a small metal plate that fit beneath the combination knob on the front of a safe. When the safe was opened it left small marks on the metal plate indicating the numbers that had been used. Now all that needed to be done was try the various combinations and you were in! When his wallet is stolen Leslie makes contact with the Police as well as his friends Jay Gould and Jim Fisk. Within a day his wallet is returned through the connection of Marm Mandelbaum. She knows of the device in his wallet and a criminal alliance is formed. 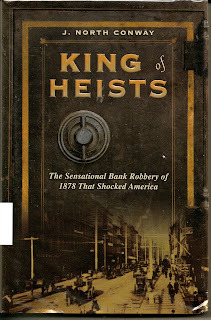 With the Gilded Age as a backdrop, Leslie and his gang set up an elaborate fake bank in a warehouse in Brooklyn. There they practice the robbery over and over until they have it down to a science. His first trial run at the Ocean Savings Bank nets him $800,0000. It was a record. What brings this man down from the highest of criminal enterprises will surprise you. His roving eye and ego are two of the things that form his Achilles heel. Set against the backdrop of Black Friday and the Gold Scandal of 1869,the book traces the scandal from Jim Fisk and Jay Gould all the way to the White House and President Grant. This is a book that is filled with things about history that are not taught in school. Some of the lessons of financial manipulation in the Stock Market apparently have gone unheeeded over these last 140 years. The book is a great look at the seamier side of New York during the Gilded Age. Written with great style and energy this is a very enjoyable and thought provoking read.